I'm having enough trouble figuring out a way to represent the steering linkages in paper! 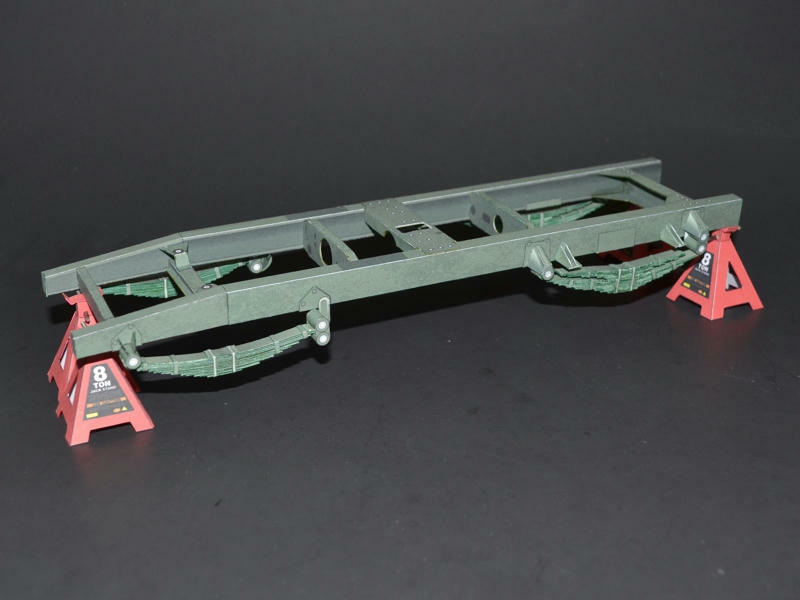 I did it on my Autocar model...made the linkages two to three times their scale thickness! But they were already thick linkages. These are much more lightweight. 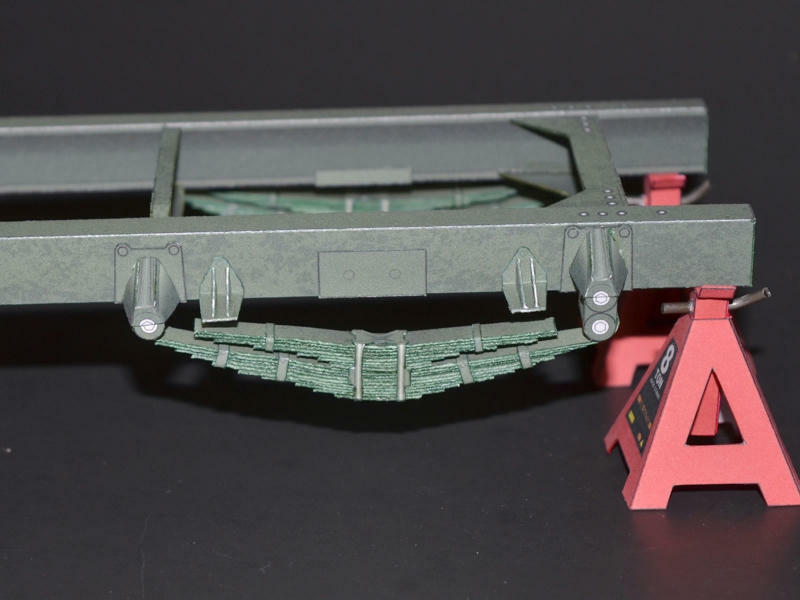 At 1/16 scale, brake and fuel lines would be microscopic (almost)! Biggest/thickest diameter line might be the rubber Brake Flex Hoses near each wheel...(at 1/16 scale) those would be less than 1mm diameter or about 1/32"!! Too small for me to build! Thats the type of detail the builder could choose to add themself using wire, etc. Not really something that can be offered in paper. But I'm sure much of those details are run inside the Frame Rail channels, and are quite hidden. Since I have boxed the Rails, it is impossible to place those things now. and some things will be partially visible...but not everything on the chassis will be detailed and complete. Some things will be suggested, but not really there. I built up two rear Leaf Springs last night. to gluing and final assembly. As you can see, I manually curved each leaf as it was attached, and the final spring is nicely shaped. I think with a template, the correct shape can be achieved. The ends will be tightly curved to fit against the shackles on the frame...and can be trimmed as needed. At this scale, the folded paper edge is not clean. I tried edge colouring, but its still shows. If you wish to take the time, maybe the leaves need to be knife cut on both edges. realizing that the Axle/Spring brackets will have to be fitted to the Springs first. This way the Axle can be fitted at the correct angle for the drive shafts. If you fit the bracket to the axle first, it locks the Axle in one position. You need to be able to rotate the Axle slightly to align the driveshaft angles. I have one Axle finished, but am rebuilding it due to the spring brackets are already glued in place. The Springs attached easily, as planned, but not without some issues to sort out. First, I found that my rear Springs are curved a bit too much. My "eyeballing" wasn't a good idea...and I have been trying to "uncurve" the spring somewhat. I plan on including a simple template in the Instructions to help you get the correct shape. After I glued the springs, to the shackles (on the frame), I put some weight on the frame to compress the springs while the glue cured. Unfortunately the weight wasn't even, and the frame capsized...dislodging one spring...and bending the shackles. I had to refit, and reglue. Second issue I have noticed...more important... is that when the springs are assembled, they tend to lean to one side. 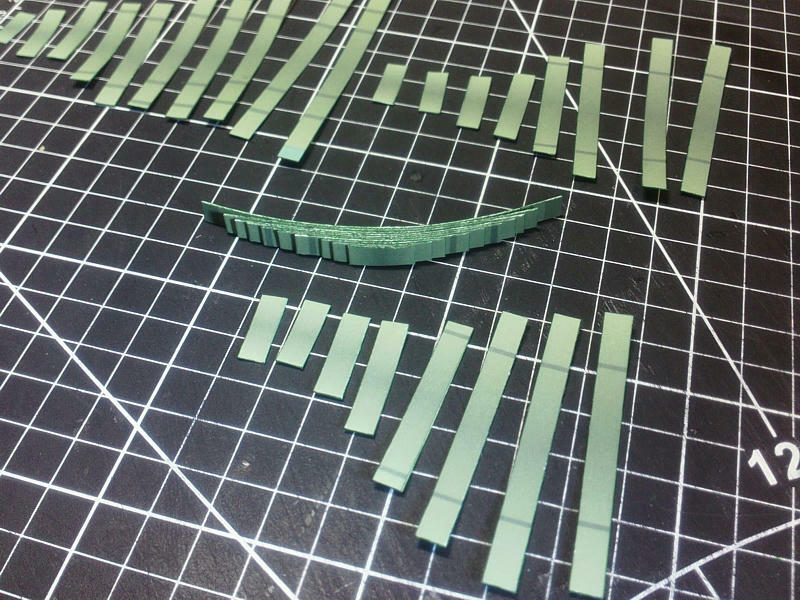 Each leaf in the spring is a scored and folded part. The fold side is a tad thicker than the exposed, cut side. And, as the leaves are stacked, in matching order, the spring starts to lean and curve in one direction. My springs are sloppy sideways like this! When the Axle is attached, I can pull the springs into alignment...but it isn't the most ideal situation. Alternating the leaves (180 degrees) during assembly, would combat the twist and lean. and that way, when the Springs are assembled, it won't matter...both sides will be the same cut edges. Will the vehicle's body be removable ? It would seem a great shame to have all the chassis detail hidden. I guess, if you chose not to glue the body in place, you could lift it off. But I doubt its going to be very secure just sitting on the frame. no...whatever goes into the chassis is just like the driver's cockpit in the Centurion. If you build it, you'll know its there! Granted I didn't get the shape perfect, I am satisfied with the spring construction. It will be up to the builder to get the Spring shape right ...I'll include a 1:1 diagram for proper shape and curve. 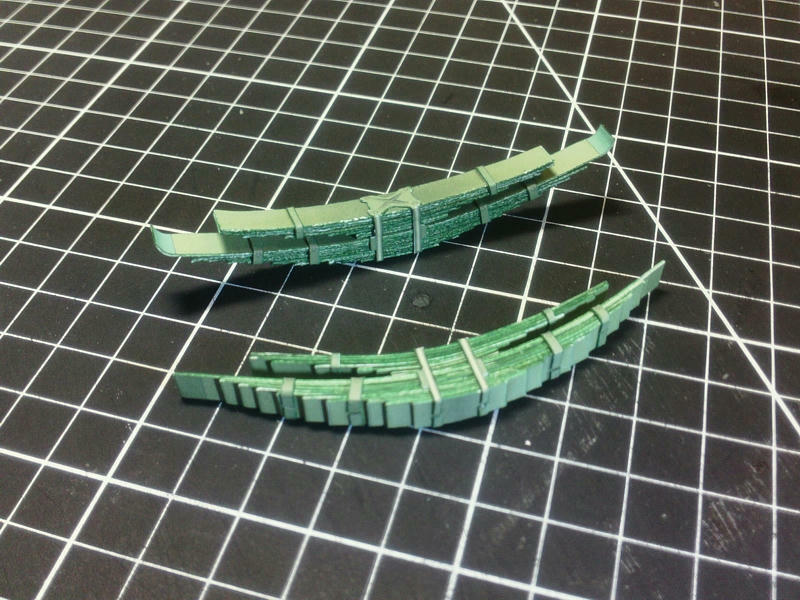 I've also modified the parts so that you cut out the entire set of spring leaves from a larger folded piece. This way each leaf is still double sided, but all four edges are clean cut and the same thickness. The springs should stack better. Its up to the builder, how well they edge colour the Springs. Mine are kind of rough and slightly off colour, but I am leaving them in place. These are the prototypes, and they're already glued. I also enlarged the spring shackles...mine look a bit rough, since they are very small and tricky to shape and colour. They need to be glued to the springs first...not the axles. Next up I am finalizing the front and rear Axles. Basically the same differential housings, mirrored for front and rear. Large Drum brakes in the rear...you can see half of the drums (the rest being part of the rear wheels). Whereas the front axle has swivel ball joint steering with smaller drums. (Front brake drums will just be part of the front wheels...what you see is the steering swivel housing on either end of the axle. I'm still sorting out all the attachments...so what you see isn't finished. But I got the basic Axle components sorted. Just got the front axle attachments to sort out now. The steering linkage is still a problem. Its all quite simple: a small Steering Box mounted on top of the frame connects with a short lever and rod to the wheel hub. And then, theres one long link that spans the entire axle connecting the two wheels. Problem is, that link is a solid steel rod, bent to fit around the differential. Its scale size makes it only about 1.5mm diameter. If it were a dead straight rod, you might be able to roll a lightweight paper tube. (I could even up the scale size to 2mm to help). It has four bends in it! making it impossible to fashion out of paper. At least for me, its impossible. And impossible to put a paper part into this kit. So...this will have to be an optional detail...and I'll include a diagram for bending wire or fine plastic rod. Green coated (bendy) Florist's wire is 1.6mm thickness...perfect! 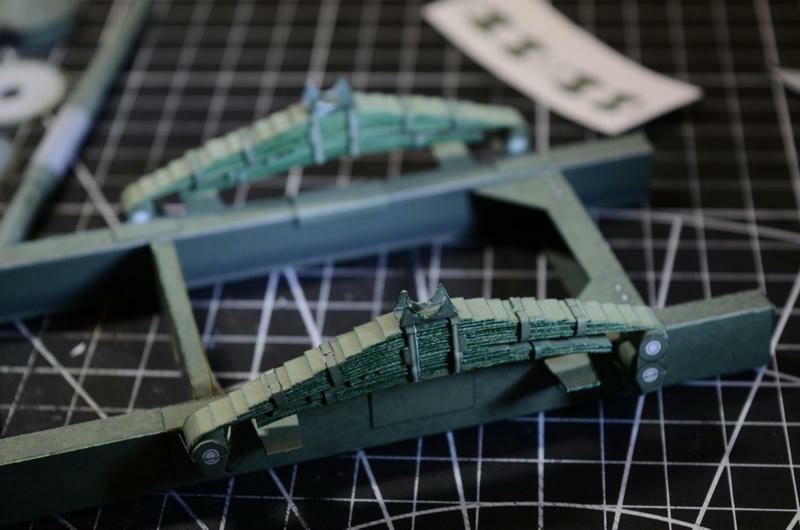 I'll try to include the necessary Tie Rod and Linkage connecting parts (made from paper). But these will be very small parts. I'll post pics once I get it sorted. You go to very great lengths to make your models entirely self contained, and commercial pre-printed vehicle kits almost always include patterns for items to be fabricated from wire (or even, in some cases, wood: "carve to shape"), so, except for the very small number of intransigent people (like those who complain that you sent them files to download patterns to be printed, cut, and assembled instead of sending them an actual tank), this shouldn't be a problem. 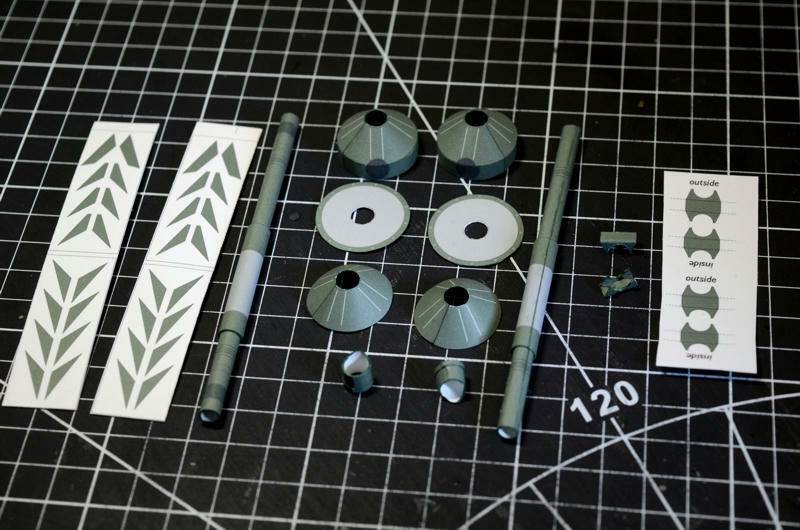 Great work on some small parts. Are you quoting from past experiences? or just in general? Because you hit on an actual experience of mine. About 5 years age (maybe a bit more) I tried selling paper kits on ebay. I created a separate account from my usual ebay account, exclusively for card models. I put up a few kits, all digital kits on CD-ROM. And I sold two or three, until one guy bought one of the Airfield Accessories Diorama Sets for about $15. 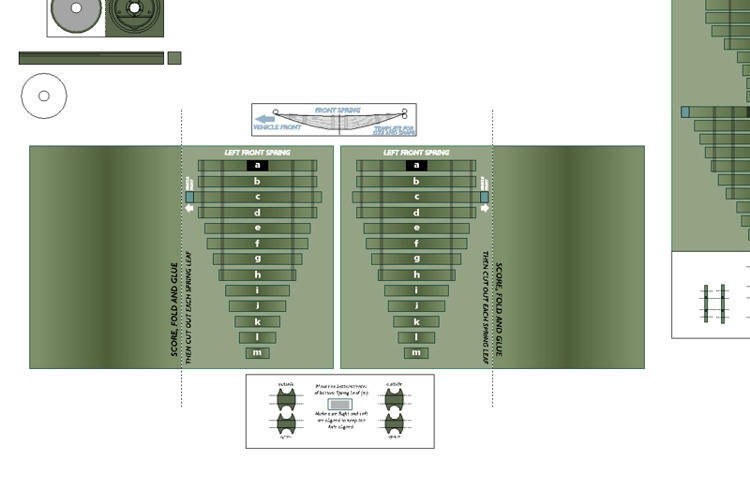 The Airfield sets contain many small models. The disc itself contains those models as PDF files. The listing showed pictures of the CD disc as well as photos of some of the built models. When he received the disc in the mail, he contacted me complaining that he expected ready-to-play-with models for his kid, not kits that he had to build. He claimed his kid was super disappointed and that I had deliberately mislead him. he claimed that I had since changed the listing (after I made the sale). He even threatened that he reported this to ebay. At the same time he left a negative feedback mark and horrible review. ...so I closed the account and stopped selling kits there. or maybe he was just trying to rip me off...? Maybe I should have offered to build them all for him?